Emmett's Birth (Part 1) - Baby Doodah! Emmett’s original due date was July 30, 2012 but because I struggled with high blood pressure throughout my pregnancy, I was scheduled to begin induction on July 22, 2012 at 7 pm. Overall my pregnancy was really easy! The first trimester I was just incredibly tired, sleeping pretty much any time I wasn’t at work and wanting to sleep even when I was at work. When all the books tell you that you’ll be tired during that first trimester, they aren’t lying OR exaggerating. I remember there was one evening that I got home from work at 5, laid down on the bed and fell immediately asleep. Seamus woke me up around 7 to eat dinner and once I’d eaten, I went directly back to bed until morning. But if I’m being honest, I didn’t hate the first trimester, I LOVE sleep and doing pretty much nothing but sleeping was A-OK in my book. 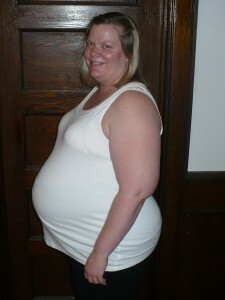 The second trimester went by without anything, other than Emmett growing as he was supposed to be, happening. My blood pressure was high but they were just treating it with meds. There would have been more concern over my BP if Emmett was showing a small size during sonograms but he wasn’t, he was right on track. They did not diagnosis me with preeclampsia because they were not finding any protein in my urine but continued to keep a close eye on my BP and Emmett’s growth. 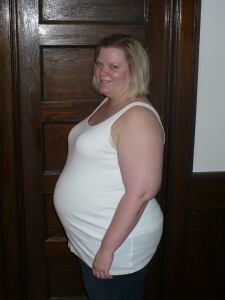 Once the third trimester rolled around, I was beginning to feel sluggish again. My knees were starting to kill me because of all the added weight of baby but there weren’t any complications. Most individuals only have 3 sonograms throughout their pregnancy but because of my BP I had almost 1 a month from 18 weeks, like I said previously they wanted to ensure Emmett’s growth was on track. Emmett and I were fortunate enough that this is not what was occurring for me. I have always had high blood pressure, way before getting pregnant (it runs in my family) so it was probably more the added weight of carrying the baby rather than the placenta not being developed in the usual way that caused my BP to skyrocket. ← What a Sunny Wednesday! I’ll right away grasp your rss feed as I can’t find your email subscription hyperlink or e-newsletter service. Do you have any? Kindly allow me understand in order that I may just subscribe. Thanks.